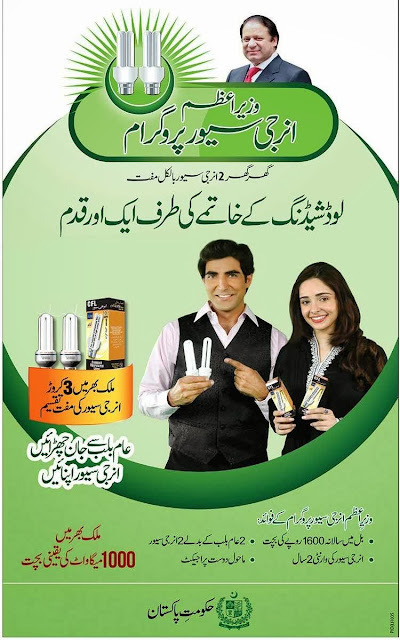 Prime Minister of Pakistan Mian Nawaz Sharif recently announced an Energy Saver program in Pakistan, the program is named as "Prime Minister Energy Saver Program". According to the initial details of the program two energy savers will be provided to every home in Pakistan. In Pakistan there are approximately 15 Million Energy Meters are installed so 30 Million Energy Savers will be distributed in Pakistan. It is claimed that PM Energy Saver program will help to overcome electricity shortage in Pakistan. This program will also help to save Rs. 1600 annually of Electricity bill cost per House. These Energy Savers will also help to save 1000 MW of Energy. The idea behind this program is to propagate the use of Energy Saving appliances instead of Ordinary light bulb. This is a environment friendly project. All the Government provided Energy Saver Lighting Bulbs will carry 2-Year Manufacturer warranty.